Are you guys sick of Missha posts yet? I sure hope not because I still have at least 6 more Missha products to review, including their snail slime skincare line (if snail slime in your cosmetics sounds weird to you, you should check out my post on Korean skincare trends). It’s an interesting brand and as well as an accessible gateway into the world of Korean cosmetics. I’m limiting my Missha-specific posts to one a week, and sincerely hope everyone is enjoying reading about them as much as I’m enjoying experimenting with them. 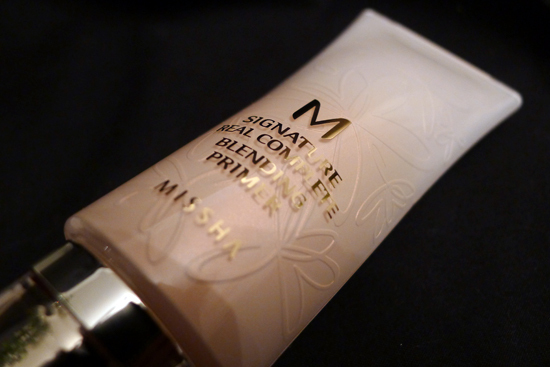 Speaking of snail slime, today we’ll be looking at Missha’s M Signature Real Complete Blending Primer ($28), which happens to feature snail mucin as a star ingredient. This luminizing primer also contains fermented yeast essence, a calming, youth-preserving skincare ingredient made popular by the high-end Japanese brand, SK II. According to Missha’s website, this silicone-based primer “contains glossy skin oil with a high refractive index and micronized interference pearl to provide shine to the skin while helping to express a healthy skin tone with a natural glow. Its lasting polymer provides a moist texture when combined with BB Cream resulting in long-lasting makeup.” Boy, that’s a lot of words. It’s also a lot of promises – natural glow, healthy skin tone, moisture, and increased makeup longevity. The fermented yeast essence and the snail slime were at the top of the ingredients list for this product, which was promising. It also contains a few other actives, including Niacinamide, also known as Vitamin B3, which is an anti-inflammatory that has also been shown to strengthen the skin’s moisture barrier. The packaging is beautiful. It looks like its sister product, M Signature Real Complete BB Cream, the only difference being the color. It features the same pump you find on all of Missha’s BB Creams. The product itself is really exciting when you pump it into your hand. It looks like liquid mother of pearl! The instructions say to mix it with your BB cream at a 1:1 ratio. I followed the directions using M Signature Real Complete BB Cream. The instructions say to mix it with your BB Cream at a ratio of 1:1. The BB cream I used is M Signature Real Complete BB Cream. My excitement about this product faded once I applied it. For one thing, the “luminizing” effect wasn’t very visible, and the little that I could see was very unflattering. It seemed to make my pores more noticeable, and my skin tone seemed to be missing the smoothness I’m accustomed to seeing with my BB cream alone. I also found it drying. I have dry skin to begin with, but moisturizer and M Signature BB cream is usually enough to keep my skin hydrated. When I added the M Signature Blending Primer to the mix, my skin felt tight after about 30 minutes, and I started seeing tiny flakes on my chin inside of an hour. I didn’t like how the “glow” accentuated my pores. It was also very drying – you can see flakes beginning to form on my forehead and chin. I ended up trying it a couple of days in row in case the dryness from the first day was a fluke. Alas, it was not. 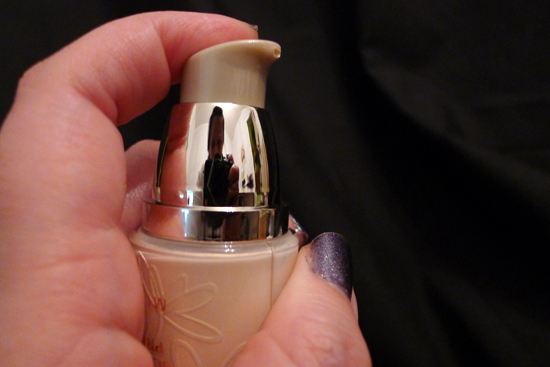 In spite of this primer’s snail mucin content and “glossy skin oil,” it was still very drying. The pore enhancing shimmer didn’t do my appearance any favors on the second day either. This primer was a dud for me. The experience actually bummed me out – I was so looking forward to this product! The presentation is so beautiful, and since I had such great success with the M Signature BB cream, I thought I’d have a lot of love for this primer. 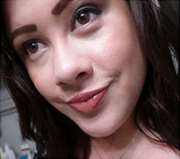 I’ve seen some rave reviews for it in various beauty forums, so it does work for some people. My guess is that this primer works great for someone who has oily skin – the drying effect it had on me would probably be mattifying for someone who’s oily. Of course, there’s still the issue of how the “glow” accentuates pores. I don’t have huge pores or anything, but they’re certainly more visible than they used to be. Someone who has invisible pores to begin with, or doesn’t mind the visibility as a trade-off for the “glow” effect would probably enjoy it as well. 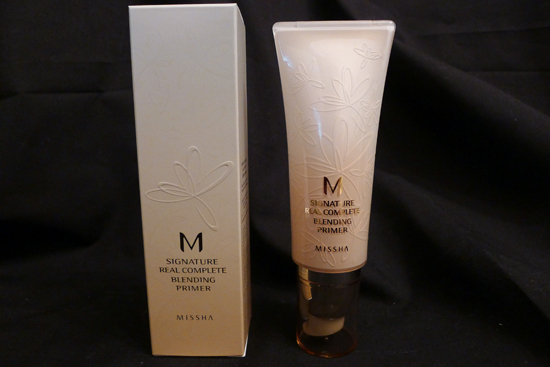 The easiest and safest place to but M Signature Real Complete Blending Primer is the Missha website. It’s priced at $28, but Missha regularly has 30-50% off sales, which would be a good time to pick this up. It’s a fairly new product, so there aren’t a lot of discount resellers out there carrying this, but I did find one on eBay that was selling it for $24. However, it ships from South Korea, whereas Missha ships for New Jersey, so it’s not really worth the $3 savings. 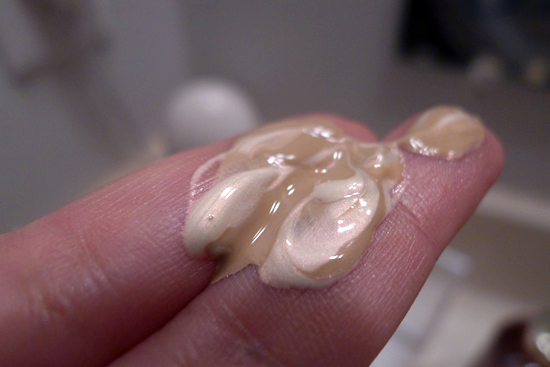 Performance: 2/5 – Very drying and “glow” effect accentuates pores. Does help with makeup longevity. Quality: 4/5 – Contains some nice skincare actives such as snail mucin, fermented yeast essence, and niacinamide. for me the biggest problem with BB cream is the longevity issue. i like the M signature BB cream when i first apply it but then it always ends up looking worse on me compared to other foundation in general. Aw, thanks! Good call on trying it in the warmer months -I think I’ll keep this around in case it works better for me then. Which primer are you currently using? 1. Apply moisturizer. THEN apply primer. THEN BB. It seems to reduce the pore-noticeablity effect of the primer. 2. I read thoroughly your skincare routine (retinols are awesome, and now I want to try that cereve cleanser! ), and I wonder if trying Asian style toner vs witch hazel might help with dry patching. For example, nearly every step in my skincare is doing *Something* to add moisture to my skin (except maybe some of my cleansers), and I even have oily skin, so it makes me think it’d have an even more important effect with dry skin types. 3. 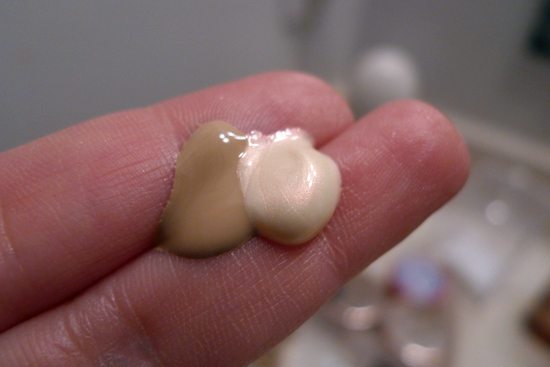 Might sound TOTALLY STUPID but try using a primer before your brightening primer. 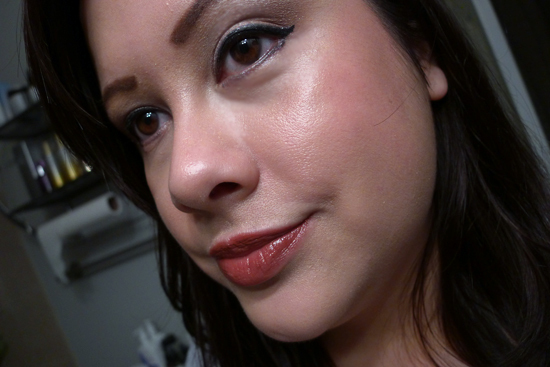 I like youngblood mineral primer, and the benefit porefessional but I have not tried many primers so I am no expert. I’d imagine the pores would not be so obvious then. Thanks for the tip! I’ll definitely try layering this on first and applying the BB Cream. Even though the instructions say to mix the two, it does seem like treating this as if it’s a regular primer might help. As for switching to an Asian toner, I definitely want to do that! I just haven’t found the right one yet. I have several in my “to try” list, and I’m hoping that one of them will blow my mind enough that I can permanently work it into my routine! I think Laneige is going to be my next experiment when I’ve finished with the Missha Aqua Snail line. I’ve heard great things about their Water Bank products. Do you have a highlighting primer that you like?